I first heard about 3 Cousins when I got a hold of one of their business cards. I wouldn’t call myself a BBQ fan, so I made a halfhearted mental note to look for them one day. Turns out one day came unexpectedly while visiting a friend who lives down the road from the restaurant. I was starving and my friend suggested we go there… BEST IDEA EVER! 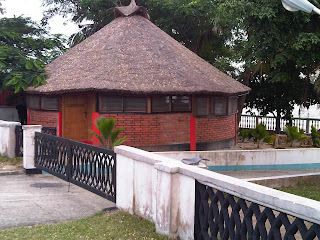 Ambiance/Décor: Let me just start with this – they’re located in a cute, cozy hut structure right by the water (I’m not very good with the names of the different waterways in Lagos, so I can’t tell you whether it’s a lagoon or ocean or whatever). Inside the hut, there’s space for maybe 6 people to sit and chill – 3 Cousins has chairs outside so you can sit and eat by the water. 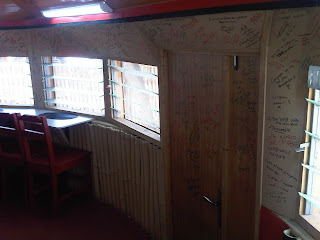 When you walk in, one of the first things you’ll notice is the scribbles on the walls, counter, table tops, etc. Since it was my first time there, I was given a marker to write whatever I wanted! FUNNEST TIMES! If you go there, look for the obnoxious signature right on the counter – yes, I felt the need to include ALL MY NICKNAMES! Anyways, it’s a charming spot. Service: The cashier is soooooo friendly, and one of the owners was there – we just sat and gisted with them until the food was ready. I really felt like I was hanging out with old friends. Overall Value: I’ll give them an enthusiastic 2 thumbs up for value. Portions are great, food is great, the place is great. You can also do take-away, or have them cater your events. And with a name like 3 Cousins & A Crook, what’s not to love? 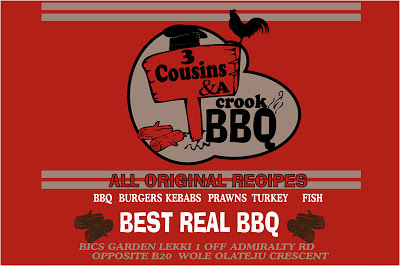 3 cousins and a crook bbq is that place you keep hearing amongst friends, peers and acquaintances. I never paid much attention until I decided to write this post ‎ about my love for dude food. 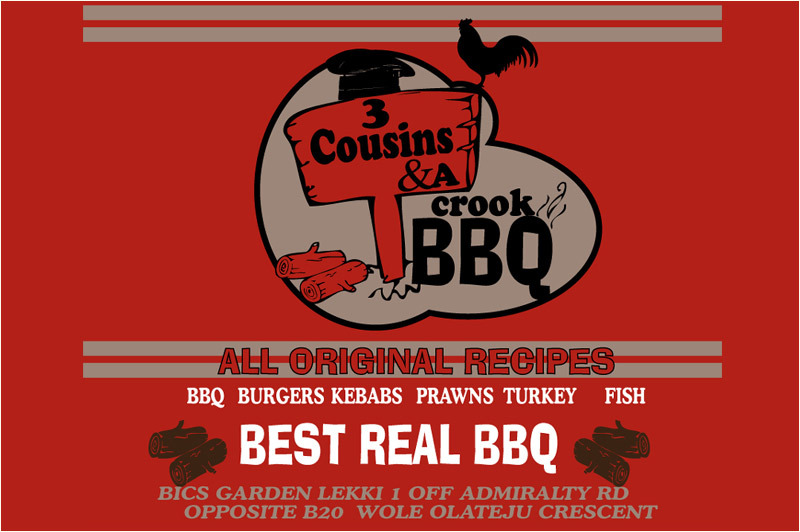 This Joint is located at lekki Phase 1, off admiralty road. Quite a distance from where I stay but made the trip anyway to find out what all the fuss was about. I walked into 3 cousins and immediately wasn’t impressed by the ambience. Its on outdoor joint with benches and tables stuck in sand. Usually I’ll go back to my car after such unappealing start…but I soldiered on. Once I got in, requested for their menu, I was immediately drawn to the crook fully loaded burger option. Cost N2500 (with one side order of your choice); I was told to wait 12mins but ended up waiting for 20mins. When the food arrived, I wasn’t particularly chuffed about the side order (fries) I got but the crooked fully loaded? Lordy lord…was it amazing. It wasn’t the traditional cheeseburger I have been on the hunt for, but this crooked fully loaded, is a perfect replacement for my favorite dude food. The content of this burger was so good…it had eggs, sausage, cheese, lettuce, beef, and some special burger sauce. Just yummy! Left me wanting more after I was done. I will join the bandwagon and recommend this place highly. It’s a MUST visit for any burger enthusiast like myself. It’s a solid 5/5 from me and will most definitely be going there this weekend but this time with a few special friends. I had their 3 crooks loaded burger delivered and I must say its good value for the cost. It came with my choice of 2 sides and a drink. Cost 2k5. Delivery cost #200. Girl all I can say is that keep up the good work. there are many Nigerians abroad who have not been home in years and this is really helpful.